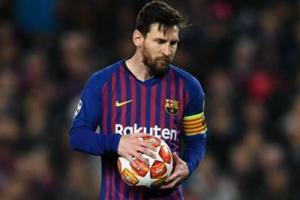 Lionel Messi's absence is a big blow for Barcelona and levels the playing field for Inter in their Champions League clash, according to captain Mauro Icardi. 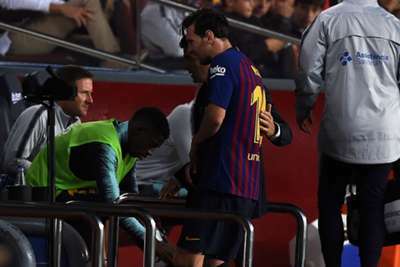 Barca will be without five-time Ballon d'Or winner and superstar Messi for Wednesday's fixture at Camp Nou after he broke his arm in last week's 4-2 victory against Sevilla in LaLiga. "It's a pity Messi can't be there because it's nice to play against great footballers like him, who is one of the best in the world," Icardi said. "He's a big miss and it means we can go head to head [with Leo gone] because we have the qualities needed to take them on." Inter skipper Icardi was the hero thanks to his 92nd-minute header at San Siro, where Milan goalkeeper Gianluigi Donnarumma misjudged Matias Vecino's cross. "We had a great September before the international break and we had to win to stay on this path, so we could arrive at Barcelona with this mentality, which is very important for us," Icardi added. "There is a lot of talk but I'm happy at Inter, with my present and the future that I can have here," Icardi said. "When offers come we will evaluate them but I'm very happy to stay."